Here are some of the things students, professors, organizations. authors, and the media are saying the ELECT TO END HUNGER AND POVERTY tour and the work of Food Not Bombs. There are also several other quotes about the efforts of Food Not Bombs and notice of an award for helping end homelessness. It is an honor to have so much community support. Please consider organizing a presentation in your community. As you can read, this is a great way to encourage people to join in the urgent work for peace and social justice. Inspire your classmates to participate in your student organization and meet local community activists by hosting a presentation. Like the people who are quoted below you can make a difference. "Hi Keith! It was an honor to meet you tonight! Thank you for your very inspiring talk and all of the work you have done to help people and animals over the years! " "I also wanted to say once again thank you for coming to Virginia Tech. The students that made it to your talk absolutely enjoyed it and we met up last week to discuss starting a FNB at VT!! We are meeting again tonight and I will let you know how things go." "Keith, People can't stop talking about your presentation here at ASU!" "thank you Keith for what you do "
"Food Not Bombs is the coolest thing ever thought up. Thanks so much for starting something so beautiful. " "Keith, you've been doing this for so many years--from the times twenty or thirty years ago the cops were beating you up for serving the homeless in front of City Hall! You're one of my heroes! " 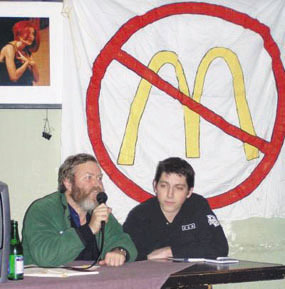 "Keith McHenry of Food Not Bombs and yours truly. Interesting talk and very insightful. Well, minus the guy in the wheelchair who screamed at everyone during the question part of the presentation about how everyone with computers is to blame for hurricanes in the gulf of Mexico. But I loved hearing about the social message behind Food Not Bombs and how it became what it is today. Keith was an excellent speaker and gave a very good presentation about himself and the organization. " " Thank you Keith for writing this book. Astounding, enlightening, encouraging and a really fun read. I haven't even finished it but find myself rushing just so I can tell others. Whoopeee!! Thank you. " "Hi Keith, It was a pleasure meeting the co-Founder of Food Not Bombs. You have made a big difference in society and I was honored to be in your presence. Thank you for agreeing to interview with me on Sunday in Hempstead. " "I just wanted to thank you again for all the help in getting the Beverly FNB started up and inspiring people to get involved. Your a true inspiration to me and everyone you met here. Your stories and ideas have truely turned my life around in a way you'll never know man!" "Hi everyone, I'd like to create a Food Not Bombs group in Lyon in September. I'm 19 years old, I'm vegan, I met Keith Mc Henry in Dijon (France) in February, I can't stop thinking about FNB." "Food Not Bombs changed my life!" "I am still in the afterglow of your visit. I was just told by a girl that this event was the best event she has seen hosted so far at goucher. thought i would let you know. happy thanksgiving." People can't stop talking about your presentation here at ASU! You had mentioned that you had some information regarding tent cities and the possibility of a mass demonstration in DC this spring. Could you please send me that information? We would like to start organizing for that as soon as possible." " I remember you speaking there (Worcester) a few times, about ten years ago I guess, and my friend Rob and i coming to meet you. It was a such a pleasure as Food not Bombs was really my life when i was growing up. I started a tiny chapter in my hometown of Burlington VT when I was 16. I then worked with the wonderful groups in Boston, Worcester, Portland OR, and Richmond and feel blessed with the amazing experiences I had with all of them. Learning to cook with FNB really changed my life- it taught me to cook and I fell in love with food. " "Food Not Bombs changed my life. " "That McHenry guy sounds like such a sweet person. He was sooo excited to be on your show and not embarrassed to express his happiness. And all the stuff those people do.......man, takes guts and persistence. " "The Diggers' philosophy influenced the thinking of a young man named Keith McHenry, who would go on to become one of the most important figures in the freegan movement. McHenry, who is now 53, came from a family with a prestigious pedigree; his ancestor, James McHenry, was one of the signers of the Constitution. Keith McHenry, however, was a nonconformist almost from birth. Throughout his 20s, McHenry traveled the country, Dumpster-diving and crashing with artists and hippies. The pivotal moment in his life came in 1980, when he was working at an organic-food store in Cambridge, Mass. "At the end of each day, I was throwing away these crates of produce - apples, lettuce, cabbage - stuff that had been bruised or was slightly imperfect in shape," McHenry told me. So he asked his boss if he could distribute this produce at shelters, churches and soup kitchens. 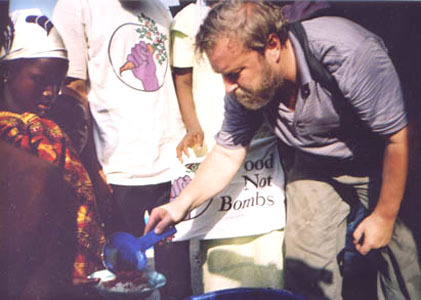 McHenry's efforts were a success, and he helped found Food Not Bombs, a nonprofit whose mission was to salvage discarded but edible food and feed the poor. Today, the organization has more than a thousand chapters around the world and has probably been the most active force for spreading the ethos of freeganism." Sociology Professor Jerry Levy wrote a letter inviting all faculty and students to consider hosting a Food Not Bombs Presentation at their school. 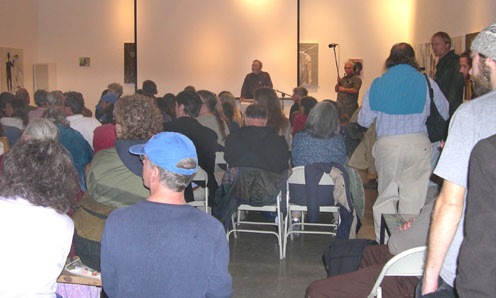 Professor Levy teaches at Marlboro College in Vermont. When he isn't teaching sociology he plays Marx in Howard Zinn's play Marx In Soho. Many Amnesty International chapters host our presentation at their schools. The director of Amnesty International Chapter (AI 101) sent us a letter inviting you to host a presentation at your campus. This page also has links to the letter Amnesty International sent to the United States government stating that Food Not Bombs volunteers would be considered Prisoners of Conscience if convicted. Keith McHenry and the other Food Not Bombs volunteers some of a small number of U.S. citizens listed by Amnesty International as Prisoners of Conscience. Please visit this page to learn more. Read the Amnesty International letters. "Since when did feeding the homeless become a terrorist activity? "asked ACLU Associate Legal Director Ann Beeson. "When the FBI and local law enforcement target groups like Food Not Bombs under the guise of fighting terrorism, many Americans who oppose government policies will be discouraged from speaking out and exercising their rights." Please consider inviting Mr. McHenry to speak to your community. Speaking fees are reasonable. Your community will find Keith's message hopeful, motivating and full of useful information sure to be an inspiration to everyone. Call us at 575-770-3377 or email us at menu@foodnotbombs.net to make arrangements. You can call us toll free at 1-800-884-1136. He will give a free presentation for any Food Not Bombs group. Please contact him for more details.